Stefano Domenicali has resigned as the team principal of Ferrari with immediate effect. The Italian team have struggled this season, failing to register a podium finish in the opening three races. Domenicali, 48, who will be replaced by Marco Mattiacci, had been in charge since replacing Jean Todt in 2008. "There are particular moments in all of our professional lives where you need the courage to take difficult and very painful decisions," said Domenicali. "It's time to make an important change. As boss, I take the responsibility - as I always have - for the situation we are going through." No Ferrari driver has won the world title since Kimi Raikkonen's success in 2007. Domenicali, who had been with the Italian team for 23 years in various roles, added: "This decision has been taken with the aim of doing something to shake things up." Fernando Alonso has claimed two fourth places and a ninth in his three races for Ferrari so far this season, while team-mate Raikkonen has come seventh, 12th and 10th. Alonso revealed his concerns at Ferrari's lack of competitiveness following the last race in Bahrain. The team's predicament was not helped when testing at the same track had to be abandoned early because of problems with the car. 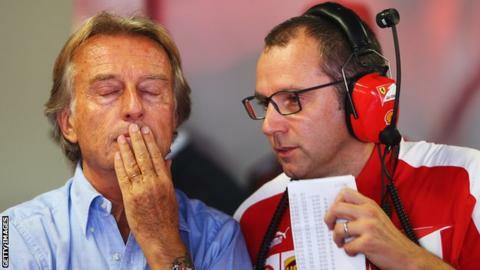 "I thank Stefano Domenicali, not only for his constant dedication and effort, but also for the great sense of responsibility he has shown, even today, in always putting the interests of Ferrari above all else," said Ferrari president Luca Di Montezemolo. Mattiacci, who is president of Ferrari North America, will take over for the next F1 race, which is the Chinese Grand Prix on 20 April. But ex-Formula 1 driver John Watson has told BBC Radio 5 live that Ross Brawn could ultimately replace Domenicali. Brawn was with Ferrari when the team won the constructors' championship in consecutive years between 1999 and 2004, with Michael Schumacher winning the drivers' title five times between 2000 and 2004. Watson said: "The gentleman coming in is probably a motor racing fan but has no idea about what it takes to become a team principal. "I suspect that's only a temporary stop-gap measure until a more suitable and appropriate person can be engaged to take the team forward. "The name that's in the frame right now is that of former Ferrari employee Ross Brawn."